To Ed Kleiman of Pray Bold ministries, (www.praybold.org) who the Lord sent to help me get back on the narrow way after I allowed my pride to take me down the broad way that leads to destruction. Since 2010 Ed has encouraged me to stay close to the Lord by reading my Bible and praying. His teaching, encouragement, and prayer conferences have been a huge help in my spiritual walk, and I am so very grateful to God for bringing him and his ministry into my life. This course has been designed to explore the promises in God’s Word regarding prayer by reading as authors E.M. Bounds and Andrew Murray reveal what Jesus said about prayer in the Bible. Too many Christians in today’s churches spend little time in prayer, resulting in few obtaining the joy and power of answered prayer. Many live in a sea of doubt about their faith and wonder if God really answers prayer. Our Savior not only spent much of His ministry in prayer, but also left detailed instructions on how we were to pray. Prayer was of primary importance when the Lord was teaching the disciples how to live the Christian life. This nine week course will help you better explore the teachings of our Lord in this most vital area of our Christian walk and most importantly, it will require you to spend time praying! We will start with examining The Necessity of Prayer by E.M. Bounds. These 14 chapters will help us understand why prayer is so important in the believer’s life. Each day we will read a single chapter and answer the reflection questions. These 14 days should increase our faith that God hears and answers the prayers of His obedient servants, while adding a newfound desire and fervency to our petitions. After 14 days, we will begin looking at Andrew Murray’s 31 lessons in, With Christ In the School of Prayer. Our faith in God’s promises to answer our prayers will grow as we finish each of these lessons. As we focus on what the Master taught about fasting, forgiveness, perseverance and boldness in our prayers, our desire to spend more time with the Lord will increase. We will finish with the command to become intercessors responsible for bringing the kingdom of God and His blessings to our fellow man here on earth. Each week we will meditate on our Lord’s words by memorizing a scripture verse dealing with His instructions or promises concerning prayer. Hiding Jesus’s words in our heart will assist in strengthening our faith in the promise of answered prayer. It has been said that any habit can be formed after 21 days. It is our hope that the reading and prayer required in this course over the next 49 days will help us all form a habit of daily meditating on God’s word as we take our petitions to the Lord. All of us need to earnestly seek the Lord during these nine weeks by reading God’s word and spending time with Him in prayer. We must ask the Master to send His Holy Spirit to lead us during these lessons on communicating with our Lord. We have included all the necessary reading (entire books) from E. M. Bounds and Andrew Murray’s books in this workbook. Each day has a new chapter followed by the reflection questions and answers. It is designed for recruits to read the chapter, answer the questions, study the weekly memory verse and spend time in prayer asking God to implant His words in our hearts. 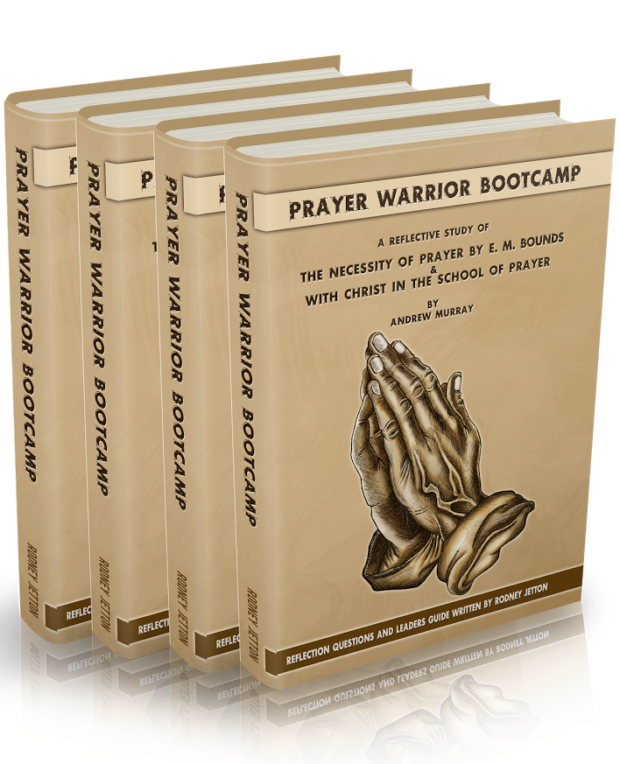 The workbook is divided into one orientation class followed by eight separate classes on key lessons about prayer (total of 9 classes). After each seven-day period there will be a class section. The final class will be a testimony time where new prayer warriors can share their answered prayers and the key lessons they learned in the class. We encourage recruits to highlight, underline or make notes in this workbook as God reveals His insights on prayer in our lives. Each day’s reflection questions will leave space for writing our impressions on how to implement what we learned about Christ’s teachings on prayer. This class is designed for no more than eight participants and is most effective with three to six participants. It takes time to effectively share testimonies, learn the memory verse and pray for each other’s needs, and any group larger than eight will make that difficult. We also recommend that recruits pick an accountability partner from the group so they can go over the daily reflection questions and keep each other on track with their reading and daily prayer time. Each class is designed to take approximately one hour and we recommend breaking it into five separate segments. (This is only a guide, as you should allow the Holy Spirit to lead each class.) We will discuss the key points from the week’s readings and share what we learned (15 min.) before giving testimonies of our answered prayers (15 min.). Next, we will spend a few minutes memorizing the weekly scripture verse (10 min.) before previewing next week’s class (5 min.). We will finish by praying for all the recruits in the class (15 min.). Theme– Have faith in the promisor. Theme– The chief object of prayer is God’s glory. Theme– Faith and obedience lead to fruit bearing. Theme– Believing and persistent prayer for His kingdom.